Superb quality on this ProRower machine. H20 Fitness’ ProRower RX-850 LTD Series Rowing Machine is now $899 with free shipping from Amazon and $749 from third party sellers. Quantities are limited so don’t miss out. 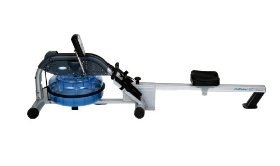 Top of the line commercial rower with a hydro-power drive system that functions as if you were rowing in a boat. The prime means of resistance is with the water from the polycarbonate tank. We bought one of these a few months ago. Really interesting getting used to the rowing action with this machine but it is a great workout!